The last four months of the calendar means food, lights, festivity and cute and out of the ordinary jewellery trends. Be it Durga Puja, Diwali or Christmas, the need to dress up and show off your style quotient to the world is something that will help you to be the diva of the town. Here are some jewellery trends that are trending this season in a big way. Earrings are the go to accessory for every woman and the trends for the season are the hoop earrings. These are large and circular and is good for both ethnic and western wear. Other than that, the chandelier earrings are stealing the show as well. This year, the concept of single earrings is also going a long way to make a hot statement. Bracelets are aesthetic, pretty and helps a person to sport a jewellery which is light, trendy and can be paired with each and every type of clothes. Be it pendants or necklaces, the festive season is the time to experiment in every way. Pendants are to be paired with western wear and when it comes to ethnic wear, then the dainty pendants can brighten up any look. Neckpieces are equally great and chokers are the go to jewellery to fall back up on. This is the year of multiple layering when it comes to jewellery and online jewellery shopping is the best place for this. Be it gold, silver or the other precious jewellery, layering them one on top of the other can give a fantastic effect. When it comes to latest jewellery designs, then the layered trend comes in handy. Gold Boho rings that are studded with crystals and stones and worn on all the five fingers are massively trending in this season. Here also, buy diamond rings online India has and been the topic of everyone. So now that you know about the most stylish and innovative of jewellery to sport this season, wait not and lay your hand on the best of the best items. This entry was posted in Brand Speak, Jewellery Shopping, Jewelry Tips on October 20, 2016 by jewelsforum. Monsoon is here and with that there is a lot of moisture in the air and with the change of weather we too need to take care of our possessions. As we need to take good care of our skin and hair during this time, you also must not miss out on your favorite jewellery. These little precious things too are affected by the moisture and are more prone to scratches this time. Read on to know how to take good care of your jewellery. You need to use dry cases where the jewellery will receive the least amount or no moisture. Invest in some good air tight boxes to store your jewellery. Paper towels are often used to dry jewellery. If used, the tissues might get stuck in your jewellery. So, it is better to use a soft cotton cloth that will avoid abrasion too. Delicate jewellery needs a gentle care and if possible, avoid wearing precious pieces during the monsoon. Rain water can take away the luster of your precious pieces. If it comes in contact with rain, pat dry with a soft cloth. Store your jewellery in separate bags made of cotton instead of other material. These are in fact the best ways to store your jewels. You can keep silica in your jewellery box; this is perfect to absorb all humidity. Silica gel protects jewellery from tarnishing too. Use mild soapy water to clean diamond or other stone jewellery twice a month. It will not only clean your jewellery but will also bring back the sheen of the piece. If any sort of scratches happen, you can go to your favorite jewellery store that offers a all round support to the customers. If you are looking for the latest indian jewellery, then Jewelsforum has the best deals at affordable rates. This entry was posted in Brand Speak, Jewelry Tips and tagged buy diamond earring online, Buy Diamond Jewellery Online India, buy diamond jhumkis online, Diamond Jewels Online India, Diamond Pendant Online, Diamond Rings Online, Latest Jewellery Designs, online jewellery shopping on July 25, 2016 by jewelsforum. Monsoon is a time that calls for wearing minimal jewellery. Be it a office wear or a casual or have some marriage parties to attend, that you simply cannot ignore, go for some light weight jewellery. Importance of jewellery can’t be ignored as it completes attire. A long dangler with a hint of a diamond is enough to jazz up your look. This will be comfortable to wear and also will make you look absolutely stylish. You simply need not over accessorize. 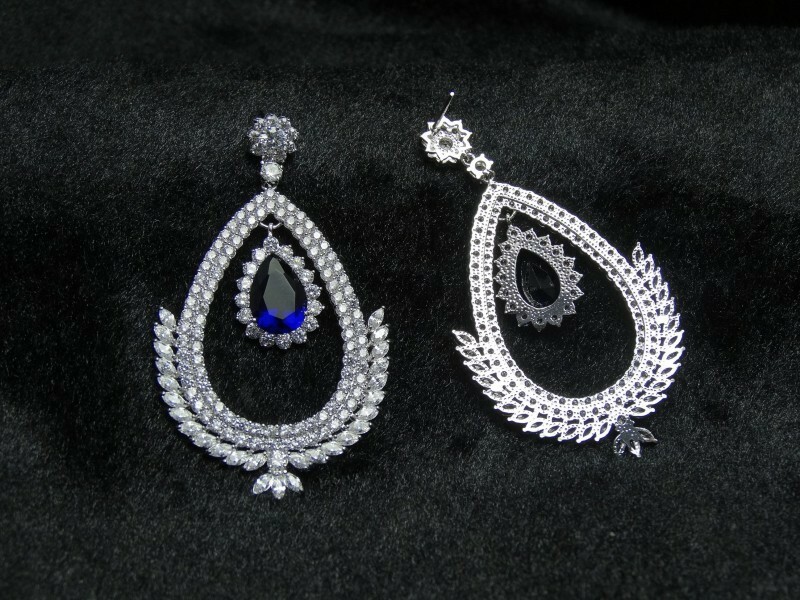 If you love to look bold then you can buy diamond jhumkis online available in wide ranges and designs at Jewelsforum. If you like simple yet small striking pieces then you can surely opt for some smart coups or stud earrings that comes with a small pearl drop. Belle Oreille, a creation by Jewelsforum will make you look smart and is perfect to make you stand out in crowd too . Wear a simple chain this season and go for experimentation with pendants. 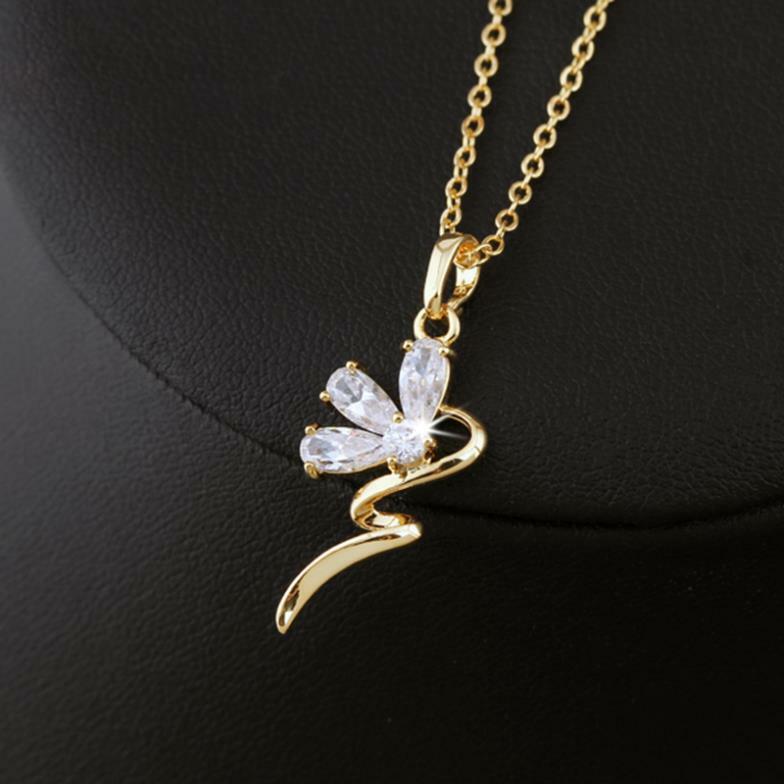 You can buy diamonds pendant online where the stores offer a wide array of choices that will spoil you for sure. If you are still not satisfied by the designs, you can surely go for customised jewellery options. If you love necklaces opt for the less ornate ones. A long bangle is enough to cover a good amount of your hand. This can be perfect as a monsoon jewellery if you wish to wear lesser jewelleries. If bracelets falls to be your choice, then go for the ones that have a hint of diamonds to make you shine like a star in a party. Avoid wearing more of jewelleries as the luster might get damaged by the rain water. Although whatever be the season a women can never go out without a jewellery, so don’t think much follow these tips and enjoy the monsoons. This entry was posted in Brand Speak, Jewellery Shopping, Jewelry Tips and tagged buy diamond earring online, buy diamond jhumkis online, Buy Jewellery Online India, Diamond Pendant Online, Diamond Rings Online, gold jewellery online shopping, Latest Jewellery Designs, online jewellery shopping on July 21, 2016 by jewelsforum. Jewellery is a lovely addition to every woman’s beauty and less or more, every woman adores herself when decked up beautifully. While winter is the no-holds barred occasion to pile on the precious and semi precious jewellery, summer demands that you go light on the jewellery to stay fresh and hassle free. In fact, this is the time when pendants, rings and hoops and huggies rule the roost. Summer time demands that one keeps the face and delicate ear free from all kinds of obstructions. Therefore, skip the dangler and jhumkas for daily wear and go for studs, hoops and huggies which look extremely stylish and also complement all kinds of dresses – be it eastern wear or western wear. Buy diamond earring online and wear them to office with the utmost panache so as to be limelight of the day. Huge neckpiece in summer is a strict no-no. They warm up the neck area and make a person fidgety and restless. So what is the solution? A pendant of course! Check out the diamond pendant online and go for a white or yellow gold one studded with diamonds, emeralds or rubies. Daily wear demands a dainty piece and party time calls for a chunky pendant that is not overpowering at the same time. Personalize your jewellery by flaunting an alphabet pendant or show your religious side by wearing a religious pendant. Best thing is that the last can be done by both men and women. Rings are 24×7 365 days a year wear. However, while one can carry rings of any size during the winter, summer demands that you go for petite and sophisticated designs in yellow or preferably white gold. The crowning glory of such rings is definitely the stones studded in them. Online diamond jewellery is the craze nowadays and there is no better place than JewelsForum to buy for the latest jewellery trends that this summer of 2016 has brought for you. This entry was posted in Anniversary Gifts, Brand Speak, Floral Designs, Jewellery Shopping, Jewelry Tips, Showcase and tagged Buy Customized Diamond Jewellery Online india, buy diamond earring online, Buy Diamond Jewellery Online India, Buy Diamond Rings Online India, buy gold jewellery online india, Diamond Pendant Online on June 22, 2016 by jewelsforum. Jewellery has always been a cherished and much loved item. However, the taste and preference of the jewellery lovers change according to season and while winter and the mellow sun calls for elaborate and heavy jewellery, spring time need you to go light on the heavy razzmatazz and concentrate of light jewellery – with floral designs preferably. So wait no more and buy diamond jewellery online. When one thinks flowers, the first flower that comes to the mind is of course the energetic and colorful chrysanthemum. JewelsForum presents one such yellow gold and diamond ring with six petals and a single diamond in the middle. The design is simple and exquisite one and at the same time. 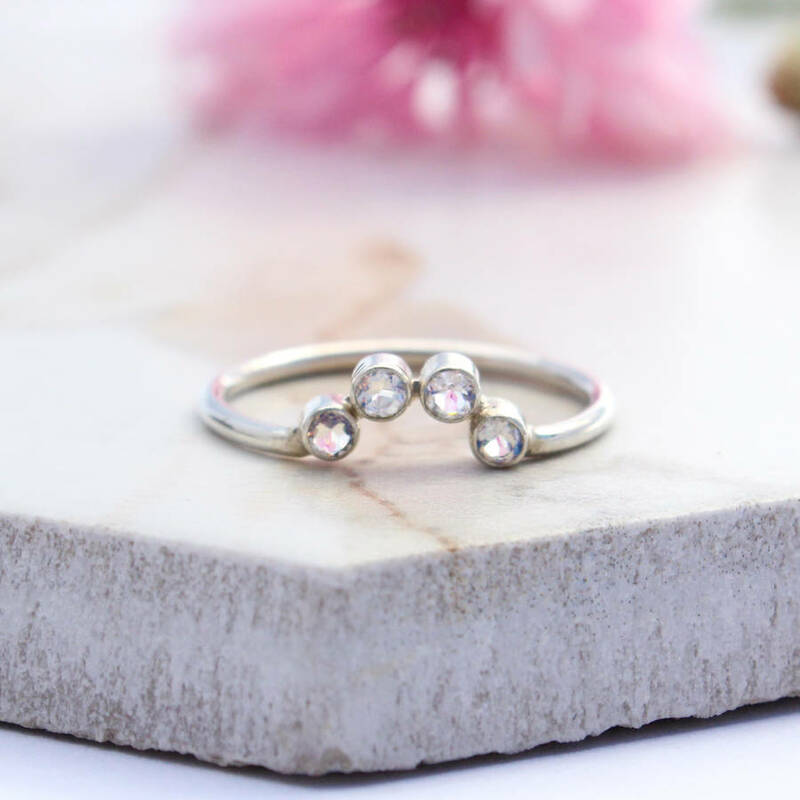 Jasmine is the go to flower for all occasions and here we have a four petal ring just like it. The petals are in yellow gold with the interior studded with dazzling diamonds for some extra effect which befits the latest jewellery designs. The name and the design are apt for spring when workplace calls for small and pretty designs. 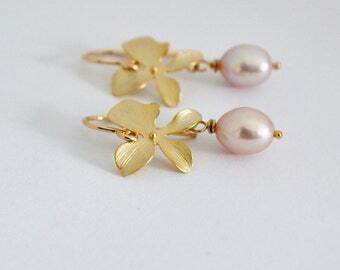 Here JewelsForum designs an earring with eight petals in yellow gold and has small multiple diamonds in the middle. 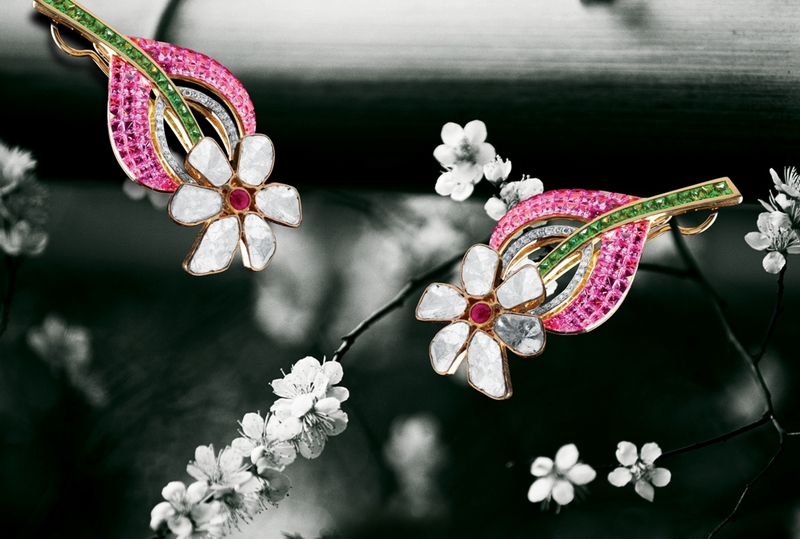 Orchids are wonderful and JewelsForum presents to you an earring that has seven petals studded with diamonds in the middle and has a ruby in the centre. The design is magnificent and soothing to the eye as well. Lotus is a well known and much loved motif in every household. Therefore, it is not bad to have it around your neck in yellow gold, studded with diamond and rubies – just like the design here. JewelsForum is all about latest Indian jewellery where the designs and quality is at par with the class and elegance with which you want to present your lovely jewellery. 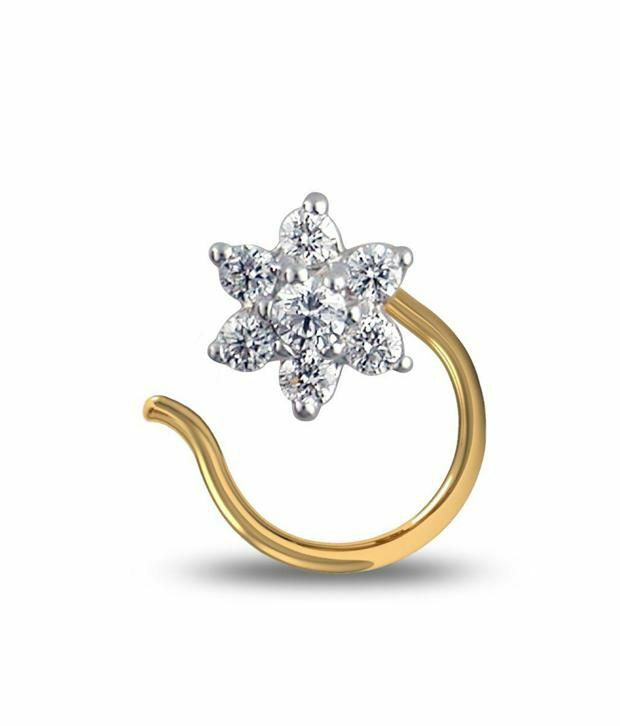 This entry was posted in Anniversary Gifts, Brand Speak, Floral Designs, Jewellery Shopping, Jewelry Tips, Showcase and tagged Buy Customized Diamond Jewellery Online india, buy diamond earring online india, Buy Diamond Jewellery Online India, Buy diamond jhumkis Online India, Buy Diamond Ring Online, Diamond Pendant Online on June 21, 2016 by jewelsforum. When a shy and apprehensive bride takes the first tentative steps into her wedded home, the first things that can calm her frayed nerve are some thoughtful and beautiful jewellery. When jewellery is the preferred gifting options, affordability and beauty are the prerequisites and here you can go for online jewellery shopping. The most precious gift for a newlywed can be a Mangalsutra. Therefore, you as her near and dear one can gift her one of those with the pendant in a detachable form. That way, it will be versatile – to be paired with a separate holder or in the Mangalsutra itself. Bangles are one of the best items of jewellery which can accentuate the marital bliss of a woman. Moreover, the latest Indian jewellery designs have evolved in such a way that daily wear bangle which look amazing as well can be fund easily. Earrings are the safest and most useful of all jewellery items that can be given as a gift to a summer bride. Either it can be a hoop or a stud to be used for daily wear or a pretty dangler for a formal occasion. The best option is to choose online jewellery shopping and get a diamond studded one that can enhance the look of a formal or semi formal dressing. On some occasions, a nosepin becomes an essential item during marriage. Again, there are many women who like to wear a nosepin for some added dash of style. If the bride is someone like that, go for a nosepin studded with diamonds and rubies in white or yellow gold. Here we have given some of the best options you can choose from to make your life a bit easier. However, the choices are endless and you can definitely try some of the other options open to you. This entry was posted in Anniversary Gifts, Brand Speak, Floral Designs, Jewellery Shopping, Jewelry Tips, Showcase and tagged Buy Customized Diamond Jewellery Online india, buy diamond earring online india, Buy Jewellery Online India, Diamond Bangles Online, Diamond Mangalsutra Online, Online Diamond Nosepin Shopping on June 15, 2016 by jewelsforum. Women and jewellery – these two terms are synonymous with each other. Jewellery has its existence because of the smitten women who adorn their beautiful selves with it. However, of all the jewellery in the world, there are some that stand out from the rest and can give stiff competition to the latest Indian jewellery or those throughout the world. This is the most valuable necklace in the world on record where the diamond piece weighs 637 carats and has the world’s largest internally flawless yellow diamond, weighing 407.48 carat at its centre. Created by Mouawad Jewelry over 4 years, it has 91 diamonds set in 18 carat rose gold and is valued at $55 million. 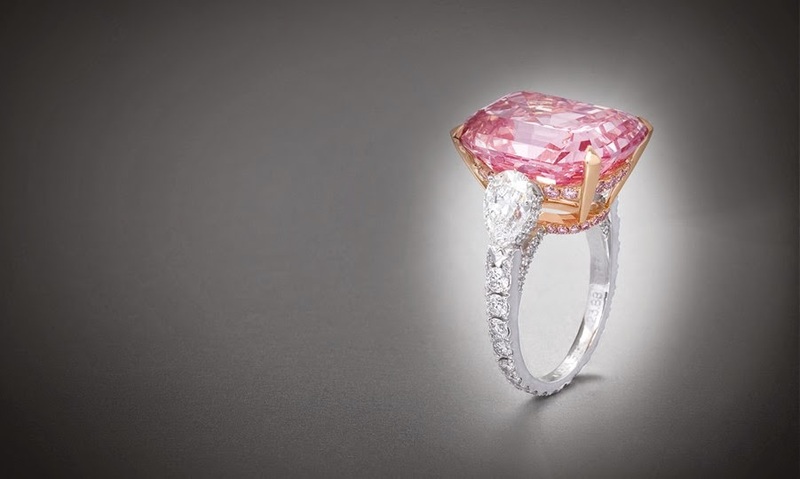 Priced at $23.2 million, The Perfect Pink has a 14.23 carat rare intense pink diamond as the centre piece. There are two colourless diamonds on two sides that weigh 1.73 and 1.67 carats. It is set in white and rose gold ring of 18 carats. Created by American jeweller Harry Winston, it was purchased by Laurence Graff, a private collector for $46.2 million in 2010. Hailed as one of the most expensive jewellery in the world, it has a pink diamond of 24.78 carats and is one of the greatest diamonds ever found. 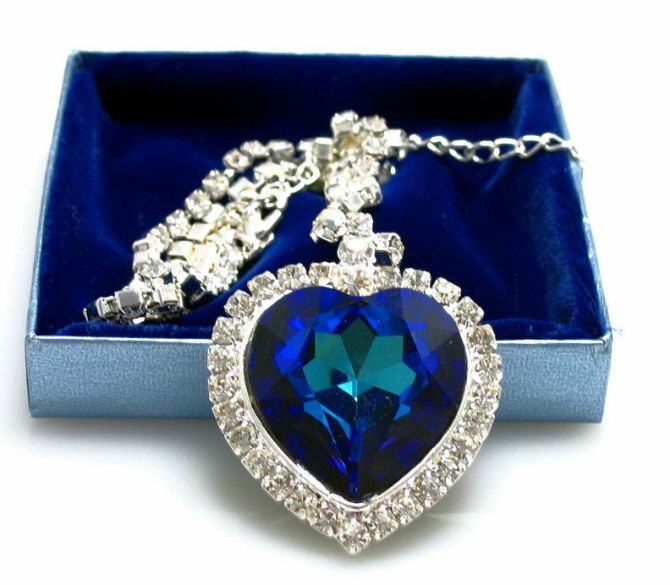 This necklace was made famous in Titanic and was created by jeweller Harry Winston. 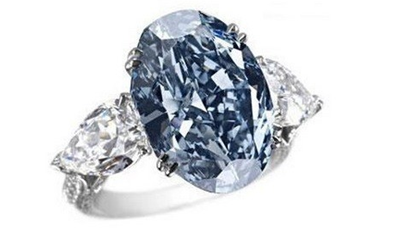 Priced at $20 million, it has a real 15 carat blue diamond. In fact, the necklace is so popular that the imitations sell for $3.5 million. This $16.26 million ring is made of an oval shaped blue diamond of 9 carats and set in 18 carat white gold. It also has clear triangular diamonds at the sides. Buying online diamond jewellery is extremely popular and the diamond rings online have exquisite designs which you will surely covet after reading about some of the best jewelleries found worldwide. This entry was posted in Brand Speak, Engagement Rings, Floral Designs, Jewellery Shopping, Jewelry Tips, Showcase and tagged Buy Customized Diamond Jewellery Online india, buy diamond earring online india, Buy Diamond Jewellery Online India, Buy Diamond Rings Online India, buy gold jewellery online india, Buy Jewellery Online India, Diamond Rings Online on June 5, 2016 by jewelsforum. Jewellery are an all season must have for every woman. Though the variety and design of the jewels may change with the passing trends, the essential love and allure of the shiny stones has and will remain intact for the coming seasons. Here are the top jewellery trends for 2016. This year, hoops have made a mark and they are nothing but the chicest accessory that has made a mark in 2016. 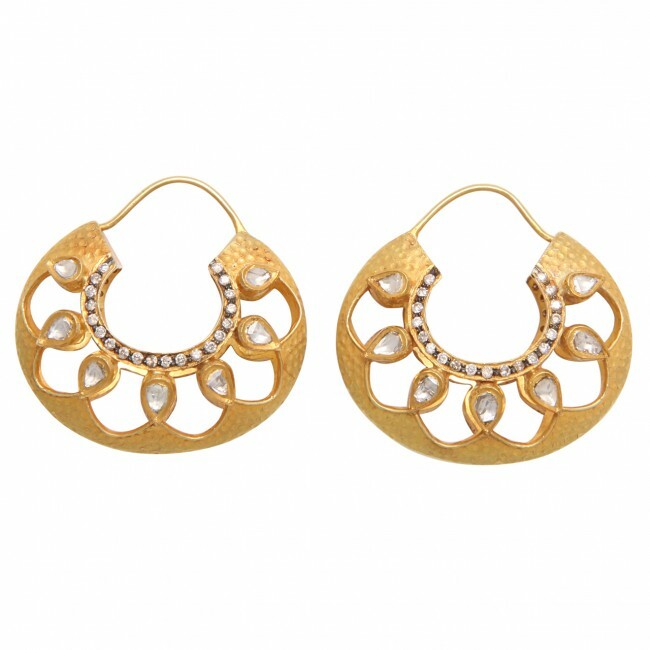 Be it tribal or geometric designs, hoops are the best thing to adorn the ear this year. Though ear cuffs have been around for quite a long time, this is the first year that they have really come into the fashion scene big time. However, the 2016 ear cuffs will have embellishments and stone and pearl studding to give a twist to the look. Statement necklace are also in for 2016 and with Oscars giving them that extra spotlight, the statement necklace by come up in a big way. The best thing is that they can be paired with any and every type of dresses. They are the latest and most versatile piece of jewellery and accessory to have come out this year. Available in different cuts and styles, they are fun to wear and can be worn as bigger statement rings or as smaller rings. Arm cuffs have monopolized a large area of the jewellery market in 2016. The accessory is extremely versatile and looks good with sleeveless dresses and blouse. This jewellery gives new life to the much neglected arms and here you have the chance to dress them up admirably. Now waste no time and get started on the trends in jewellery for 2016 and make any and every dress you have a jazzy one. This entry was posted in Brand Speak, Jewellery Shopping, Jewelry Tips and tagged Buy Diamond Rings Online India, Buy Earrings Online India, buy gold jewellery online india, Buy Jewellery Online India, latest indian jewellery, Latest Jewellery Designs, Online Diamond Jewellery, online diamond jewellery shopping on May 30, 2016 by jewelsforum. Engagement ring is one of the most important possessions that will stay on with a person as a memory of the day when two people formed a new relationship. Therefore, the importance of the latest jewellery designs cannot be emphasized too much. Here are some salient points which have to be considered while buying diamond rings online. The first and foremost thing to decide on is the metal and the stones set in it. The four most important engagement ring metals are platinum, white gold, yellow gold and rose gold. While platinum is the most popular, it is also the hardest and cost at least 50% more than any other metal. As for the stones, 90% of engagement rings feature diamonds, though you can choose a sapphire, emerald or ruby to stand out. However, the safest options are diamond and sapphire because they are the hardest precious stone and perfect for regular wear. Next you have to decide on the ring style and here the options are innumerable. There are solitaire, halo and band engagement rings to choose from. The shape of the stone speaks a lot about the wearer’s character so decide from amongst round, marquise, princess, oval, pear and heart shaped precious stones. The stone settings adds extra panache to a diamond ring and the various designs are prong, channel, bezel and pave. Last but not the least is to know whether your fiancée like modern and clean designs or has a fascination for vintage and ornate designs. If there is one thing that can make or break a perfect plan, it is the budget. Therefore, calculate your expense and see how much you can spare to buy that perfect engagement ring for your partner. You can always buy online diamond jewellery where the designs are exquisite and the prices reasonable. This entry was posted in Engagement Rings, Jewellery Shopping, Jewelry Tips, Showcase, Wedding Jewellery and tagged Buy Diamond Rings Online India, Buy Earrings Online India, buy gold jewellery online india, Buy Jewellery Online India, latest indian jewellery, Latest Jewellery Designs, Online Diamond Jewellery, online diamond jewellery shopping on May 27, 2016 by jewelsforum. Being a summer brides are one of the toughest proposition and the greatest challenge is a put on the heavy jewellery which marriage time dictates. The necklace, bangles, earrings, nath – everything dictates that one has to be turned out primly and properly. However, in the midst of all this, one has to remember to stay comfortable so as go through the rituals without any hassle. When we are talking about wedding jewellery, one great options to fall back upon is online jewellery shopping. This negates the tiresome work of going out to shop for jewellery that can be done while sitting at home. The first thing to buy is an eye catching necklace that is either in kundan, meenakari, jadua or traditional gold designs. The most popular ones for summer are BIB necklace, satlada, sitahaar and others that do not sit closely on the neck. When it comes to the hands, the haath phool is a must have along with bala, gokhru, armlets or anything else that is unique to the region from where you belong. Wedding is a once in a lifetime affair and every woman wants to be turned out to perfection. Therefore, an amazing saree or lehenga is a must but go easy on the embellishments like crystals, zari and net which will make you feel even hotter in the sweltering summer. Rather, try a threadwork, chikan and banarasi saree which looks gorgeous and is less of a hassle for the overworked summer bride which you are. This entry was posted in Jewellery Shopping, Jewelry Tips, Wedding Jewellery and tagged Buy Earrings Online India, Buy Gold and Diamond Jewellery Online, buy gold jewellery online india, Buy Jewellery Online India, latest indian jewellery, Latest Jewellery Designs, Online Diamond Jewellery, online diamond jewellery shopping on May 26, 2016 by jewelsforum.